The Port of Oakland and city leaders are developing the West Oakland Truck Management Plan in an effort to reduce the impact of freight haulers moving through residential areas. The plan outlines strategies that are meant to limit disruption from truck traffic and truck parking, increase safety along freight corridors and educate drivers on preferred routes and parking restrictions. The plan targets West Oakland, the neighborhood ensconced by the port. Trucks funnel through West Oakland to retrieve or drop off cargo. Richard Sinkoff, director of Environmental Programs and Planning for the Port of Oakland, estimated that 2,000 to 3,000 heavy trucks call on the port every day. According to a Port of Oakland press release issued Nov. 19, additional trucks are expected in the area as the city develops property at the former Oakland Army Base nearby. Sinkoff said that port and city representatives created an environmental plan for the former army base’s redevelopment, which prompted them to create the truck management plan. Specifically, the management plan calls for prominent signs indicating freight routes in an effort to divert drivers from residential streets that may be ill-suited for big trucks. Sinkoff identified 7th Street, Adeline Street and Market Street as important city routes for trucks moving to the port and the many factories in the area. The plan also lists precautions such as high-visibility crosswalks and pedestrian safety zones. 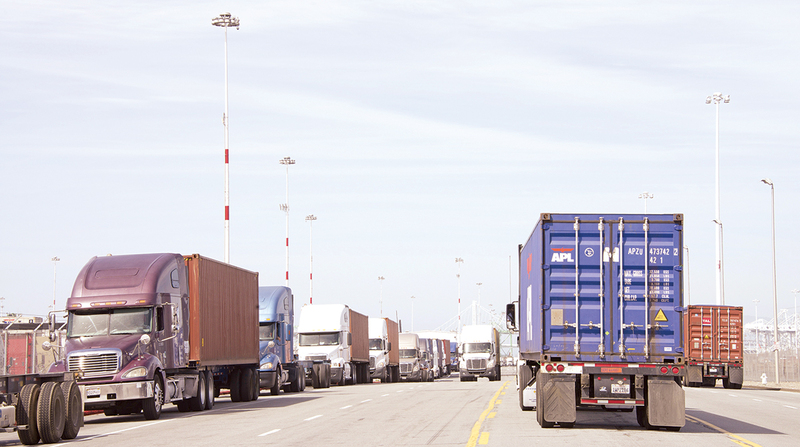 Truck parking spots total about 3,200 on Port of Oakland property. Sinkoff said truckers will park on neighborhood streets to dodge the port’s parking fee. In an effort to reduce the number of trucks parked on such streets, city staff members will receive refresher courses on how to write citations for trucks and trailers. Officials also will consider increasing fines for truck parking violations, according to the plan. The Port of Oakland, which encompasses a seaport and airport, moves 99% of the containerized goods that flow through Northern California. The port imported more than 82,000 industry-standard 20-foot equivalent units, or TEUs, in October. Besides presenting issues associated with safety and congestion, trucks moving through neighborhoods create air-quality problems. According to a study from Rutgers University, diesel exhaust contributes to particulate matter air pollution, which has been linked to asthma, cancer, heart attacks and lung disease. Robert Laumbach, director of community outreach for the Rutgers Center for Environmental Exposures and Disease, worked with residents of Elizabeth, N.J., to count trucks moving down a particularly congested neighborhood street in 2014. In 2017, they succeeded in persuading city officials to pass an ordinance restricting heavy trucks on that road. Since the initial truck count, Laumbach and fellow researchers have found an 80% drop in black carbon and ultrafine particle counts in the neighborhood. Oakland officials conducted a similar exercise with residents. Sinkoff said community leaders showed port representatives certain “hot spots” in the neighborhood that are characterized by heavy truck traffic. Although he acknowledged that trucks have become more environmentally friendly in recent years, Sinkoff said the management plan will further reduce air pollutants in the neighborhood. Port and city leaders hosted four workshops as part of a public outreach effort as they developed the 38-page management plan. Members of the public have until Jan. 4 to submit comments on it. Sinkoff said he hopes the plan will be finalized by spring.